How many times have you sat down to write a blog and one of the following things has happened? 3. You have spent two full days writing one post and wondered how everyone else is doing it. I’ve been blogging since the days of MySpace before blogs were even a thing. And when I write blogs for business, they can take a long time. A reeeeeaaaalllly long time! 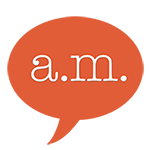 But I have found that my good old friends PROCESSES keeps me on track, provide more topics than I can keep up with, and speed up the creation of blog posts so much that I am now able to write weekly for Abask as well as a few other clients. Today, I am going to go through my blogging process with you and I’ll provide you with the Evernote template that I use. 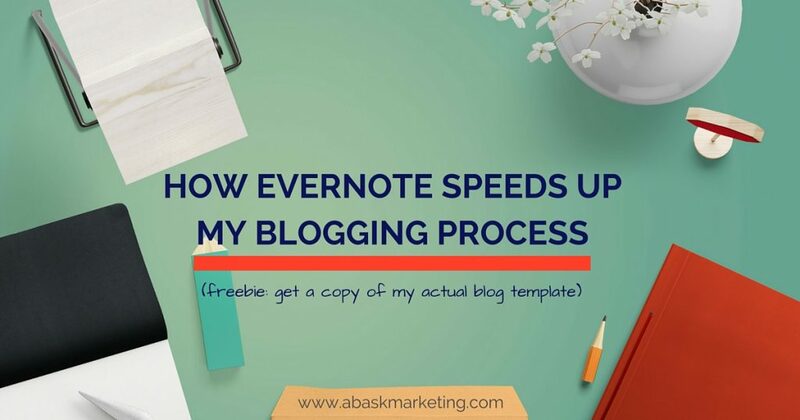 I'll go through my blogging process with you & give you the Evernote template I use. How to organize your blog post. 1. Download Evernote. You can download it free and use it free. If you want to know more about Evernote, jump back to this article I wrote about all of the tools we absolutely must have to keep our business ticking along. If you already a little about Evernote, for the purpose of this blog, think of Evernote as a physical backpack, full of notebooks and folders. This will help you keep things in context. 2. In Evernote, you need to create two notebooks called Content and Templates. In Templates, you will create a blog template and a marketing calendar that you can use over and over (speeding up the creative process, see). The marketing calendar, plonk it into the templates folder and leave it for now. Then you will download the blog template I have created (below). Download it, plonk it to templates and leave it for now. Now I’m going to go through the setup. In there you will create a table, like the one above and every time you have an idea, you write it in here. Trust me, if you get in this habit, you’ll have ideas up the wazoo. And if you invest in the paid version of Evernote, you’ll be able to sync your ideas across your phone, tablet and computer, so the ideas can be captured no matter where you are. Go back to the marketing calendar template, select the next month and copy it. Close that note and return to your March 2016 note. Below the table, paste the monthly calendar. You can use this in so many ways: to manage deadlines, to track when you posted or to simply manage the holidays that you might want to talk about in your blogs. I do it the last way because I don’t feel it necessary to track when I posted my stuff in more than one place. If I don’t feel like I’m going to keep up with it, why bother? Now you know what you will post, let’s get down to the meat of the matter. How do we write the blog post? I use a mixture of methods that I learned from Michael Hyatt, Amy Porterfield, David Allen, and the outlines I use for planning speeches and presentations. The Blog Process, Step Two: Planning. I start on a Friday. First, there is the blog planning section. This top section is where you understand exactly what you will write, for whom, and why. This section is going to keep you on track and also forces you to consider what the value of this blog will be. If you aren’t sure what the value (or rationale) is, maybe you’re wasting your time and bothering your fans with info they don’t need. This section also brings together everything you need for the blog. I don’t fill out all of the bullets (the Resources section) before I start writing, but as I write I usually remember an article I read that I should save here to share with my readers. I use this section to collect the info in one place. *I wouldn’t bother adding the links in the text because you will be using bit.ly to shorten them anyway. Don’t do anything that is going to stop the flow of your writing. This will slow you down immensely. The Blog Process, Step Three: Create Content. So, after rationale, jump down below the line and start writing. You will eventually delete the headlines (Lead Paragraph for example), but they are a great way to make sure you don’t miss any necessary info. Without these prompts, you might forget that your audience needs to know why they should care about this subject (see the rationale headline). I’m going to say it again because it bears repeating: just write here. If you have a thought about an image or a link, make a note in the planning section and keep writing. Don’t stop writing until you are finished with the first draft. Don’t stop writing until you are finished with the first draft. Once you’ve finished your first draft, go back to the planning section and add in those links you thought about. Think about the blog post. Are you super proud of it? Is it really long? An epic blog post is one you think could have maximum impact and should be nurtured more than most blog posts. If this is an epic blog post, you’ll want to put extra work into it and you should expect more results. That is, more leads, more people signed up to your lists, more sales. If your schedule allows every blog post to be epic, that’s awesome! Go to town! If you’re a normal person, I recommend no more than one epic blog post each month. The time commitment is well worth it in the long run, but initially, it’s hard to keep that going each week and consistency is king when it comes to blogging. So, now you’ll need to start thinking about how to get your audience from this blog post to your ultimate goal (contacting you, signing up to your list, buying your schtuff). For me, I am always looking to bulk up my list so that I can build a relationship with people I may be able to help. So I offer downloads to get people to sign up. Not everyone will download my goodies and that’s perfect because not everybody is a good fit for me and vice versa. I use LeadPages to deliver my free downloads to people, so at this point, I need to start brainstorming about what downloadable content can I provide to my audience that is relevant and useful? I make some notes in the Resources section. Then I close up the notebooks and walk away. The Blogging Process, Step Five: Make it Look Purty. I revisit the post on Friday evening. I read the post through with no distractions and make edits. Then I carry my computer to the couch and pour a glass of wine! I add the links to bit.ly This is an extra step that I like to take because I find it SO easy to track my link, but it’s an extra step and not completely necessary if you use Google Analytics, or even Jetpack! I move the post to WordPress and start adding the links in and checking the html. Still, in front of the TV, I start creating my images – the Featured Image and similar images for social media. On Saturday, I work through the images and the lead magnet. I do NOT read the blog post. This is important. You want to forget the content because then you’re more likely to catch any errors that you made when you read it next. On Sunday afternoon, I read the blog post aloud and check the preview. I make sure my subheadings are good, all of my images are tagged, and I have included keywords and that my SEO plugin Yoast likes the post too. I go through my checklist and make sure I have checked everything off. By Monday, the only thing left is to check the links all work and let my list know that I’ve published something that they might find useful. Now, if the blog post is an epic post, you have some more work to do, but I’ll be honest, you probably have a little more time than you might realize with this. As long as your post is evergreen (meaning it stays relevant and is not tied to a date or an event) you can create an ad for Facebook at any time, or a Periscope video to promote it. Include the date of your Periscope in the email to your list. Schedule some teasers for Twitter and Facebook to drum up attention for that Periscope chat. Create a 1-minute video about the topic and mention you will go through the whole thing on Periscope on X date. Post that video as an ad to Facebook. On the scheduled date, put your lipstick or bowtie on and record our Periscope chat. Post that video to YouTube and Facebook. Consider editing snippets out to share on Instagram. And phew, that really is it!! Now, that you’ve put this much work in, you can consider each blog post an investment that should bring you great results. So, the final thing to do, is set up a reminder on your Evernote plan to follow up and collect the stats in one month and again after three months. 4. Fill out the planning section at the top of the blog template. 5. Write your first draft. Don’t get distracted!! 6. Decide if this post is epic. 8. Start going through the checklist. Have you tried Periscope yet? Does it give you the heebie jeebies or do you feel quite comfortable on live Internet?